For people who prefer small cubelets of ice rather than the traditional cubes, the option of buying a nugget ice machine for home use appeals. 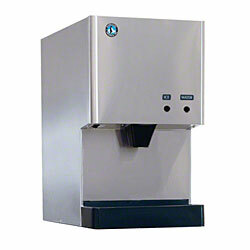 These machines make small marble sized, easily chewable pellets of ice that are great for use in beverages. Unfortunately finding nugget icemakers for residential use is very difficult, as most of the machines that produce this type of ice are designed for restaurant or commercial use. Firms like Scotsman, Manitowoc and Hoshizaki make plenty of nugget style ice-machines, but they are generally too large and expensive to be practical for most homeowners. One of the smallest units available is the Hoshizak i DCM-270BAH, which produces almost 300 pounds of ice nuggets per day for a purchase price of a little over $3000. This countertop unit could be used in a home at a pinch, but it would be serious overkill for most people. The reason for the paucity of cheap nugget ice makers is that production of this form of ice is a relatively expensive process. It will be produced almost continuously by freezing water on the inner wall of a cylindrical evaporator. A rotating auger collects this ice as it forms on the wall of the evaporator, and extrudes the nuggets. This is clearly a much more complicated process than simply freezing ice cubes for future use. If a homeowner has their heart set on one of these nugget ice machines, probably the most affordable route is look into purchasing used equipment from a failed restaurant or similar business. The food service industry is highly competitive and there will generally be a steady stream of restaurant quality refrigerators, freezers and icemakers available at bankruptcy auctions. Some people report success with visiting their local Sonic Drive-in (a fast food retailer) and purchasing ten-pound bags of nugget ice. While a little inconvenient this is a very affordable solution if an amenable location is nearby. Another low-budget solution is to purchase a hand-cranked ice grinder. This can be used – with some effort- to crush ice cubes into a shape that resembles the traditional marbled nugget. Another option is to obtain a commercial snocone machine and icemaker; this will cost less than a real nugget ice maker for home but can produce crushed ice for home usage. Finally, the truly frugal solution is to simply purchase an ice cube tray that makes very small ice cubes.